Add water and mix. The dough will be sticky and a little wet. Cover with plastic wrap and let rise for 8-24 hours...or more. The longer it sits, the more chewy and flavorful the bread will be. Also, the wetter the dough is, the more airy the bread will be. Place enamel cast iron pot in oven. I use knockoff of a Le Creuset pot but anything that is heavy and has a lid will work. Set oven to 450 degrees and preheat pan with cover on for 30 minutes. While pan is heating, remove dough from bowl and place on a floured work surface. 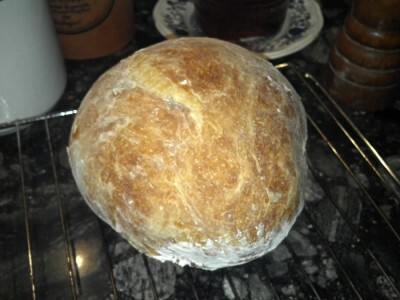 Sprinkle with flour, knead a couple times and form into a ball. Cover with towel. When the pan has heated, simply drop dough ball in and cover. Bake covered for 30 minutes. Remove cover and bake for 15 more minutes. Remove from pan and let rest on a rack for 10 minutes.